We are a company from Muehlhausen in Thuringia (Germany). 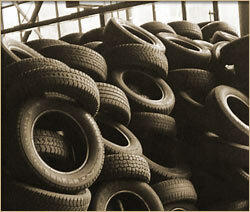 Our work focuses mainly on the export, purchase and sale of used tyres and carcasses. We can offer you a large range of tyres - new tyres (from sales of remnants and special batches, also older DOT), and used tyres in all sizes and dimensions. As we are based almost in the very centre of Germany, we can promptly respond to your demands and wishes. Our storehouse holds more than 50,000 tyres sorted according to size and qualities and includes an associated sorting facility. Smooth, global logistics on schedule and the handling of all customs clearing formalities characterise our company as a first-class exporter into the US, Europe, Australia, Asia and Africa. Our service team headed by Mr. Peter Heyer will always be happy to assist you also with special requests and wishes. Also in the area of the disposal of used tyres, we can daily provide our clients with an excellent service because of our own HGV fleet. Simply give us a call and you will find out that Reifen-Heyer offers you an exemplary service, unrivalled low prices and the top quality of well-known brands.